Pub crawls, two-for-one offers and "all you can drink" nights - they are all things you would usually associate with the UK. But there are worries this binge-drinking culture has made its way to Italy. And it is the young Italians doing the drinking. Walking through the piazzas in Rome, behind the backdrop of historic sites such as the Pantheon or the Trevi fountain, the pubs and cocktail bars could be mistaken for those in any city around Britain. One pub on the edge of the square in Campo de Fiori has colourful signs outside, enticing people in with three-for-two offers. And a few metres down a cobbled alleyway, the next pub boasts cheap cocktails and super strength shots. "I drink because I work all week and on Saturday and Sunday I like to drink," said 21-year-old Federico, who lives in the city. "I can drink five, six, seven, eight, nine or 10 in a night." It is a similar story at an all-night club by the beach, just 20km (12.5 miles) outside the capital. With a cocktail in hand, 20-year-old Nicola said the culture was changing among young people. "I think young people drink more," she said. "It's just a new generation of people." Beer, shots and spirits are quickly taking over from wine as the drinks of choice - and young Italians are moving away from the more restrained, Mediterranean style of drinking. Figures show that while under-25s in Italy are drinking more than they used to, it is still nowhere near the levels seen in countries such as Finland, Denmark and the UK - but the change is still something even bar owners are noticing. Lason Hannick, who runs Mulligans pub in Rome, said: "There's a massive growth in cocktail bars, Irish pubs and venues that strictly sell alcohol, as opposed to the Italian-style bar, often in areas that are not on the tourist trail. "So, that shows there's definitely a new trend among Italians." He added that the main place the change was being noticed was in the till. "This pub's making more and more money every year and I think it's down to the fact the Italians are drinking more," he said. As the bars tout their offers, cities are beginning to clamp down on under-age drinkers. 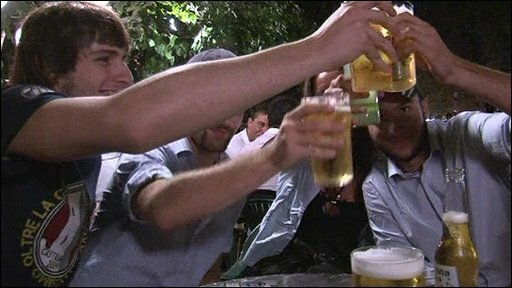 In Milan, parents whose children are caught drinking can be fined up to 900 euros (£790). And in parts of Rome this summer, drinking on the streets has been banned after 2100. It is a measure the city official responsible for the ban, Dino Gasperini, wants extended all year round. "The arrival of younger drinkers means alcohol is no longer properly appreciated," he said. "People don't seek out nice beer or nice wine, they drink anything. Our historic town centre has become a meeting place for thousands of young people and they're just getting younger and younger." Other cities are looking at introducing similar laws and there is a nationwide campaign to raise the legal drinking age from 16 to 18. Dr Emanuele Scafato, from the Italian Institute of Health, is in charge of alcohol research for the Italian government. "Happy hours, drinking as much as you can and pub crawls - they are all elements that don't fit in the Italian culture," he said. "Many people come back from London or Ireland and they also keep a part of that culture. They meet together and to have, why not, a different evening. Many years ago it was absolutely not seen in Italy and now it's a rule." But this new phenomenon of binge drinking is rapidly growing among the younger generations. And the traditional Italian way of savouring a prosecco or a glass of chianti is slowly slipping away. "They use alcohol in exactly the same way as people in countries in Northern Europe," said Dr Scafato. "This is something we've never seen before and it's particularly worrying because drink-driving is the first cause of death among young people in Italy. These are numbers but behind these numbers are people and these people are our children. "We were not used to people sitting in the road, drinking cans and cans of beer and bottles and bottles of wine."